Karen Russell’s Swamplandia! wowed me (if you haven’t read it, do it now), so when I found out that her brother penned a collection of essays I had to pick it up. Kent Russell’s I Am Sorry to Think I Have Raised a Timid Son is very different from Karen’s writing (she writes offbeat fiction, he writes literary nonfiction), but the siblings share a spectacular amount of talent. It doesn’t seem quite fair that one family contains two literary virtuosos. 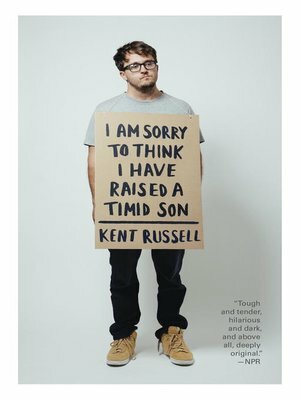 In I Am Sorry to Think I Have Raised a Timid Son, Kent invites readers on a hilarious and intimate exploration of self and society’s fringes. Russell shares frank vignettes of his familial relationships and childhood, parlaying them into observational portraits of the unorthodox people he encounters. He mingles with misunderstood Insane Clown Posse fans at the Gathering of the Juggalos. He spends an alcohol-fueled weekend with a self-immunizer, a man who conditions himself to survive poisonous snake bites by injecting himself with venom. He visits a retired (and possibly brain-damaged) hockey enforcer, takes in an Amish baseball game, enrolls in a course taught by a horror movie make-up artist, and maroons himself on a deserted island with a modern-day Robinson Crusoe. Kent Russell is a robust voice in nonfiction. He is sure to become a favorite among fans of Hunter S. Thompson and David Foster Wallace. You can read more of his essays in The New Republic, Harper’s, GQ, n+1, The Believer, and Grantland. Originally posted on OverDrive Blogs.